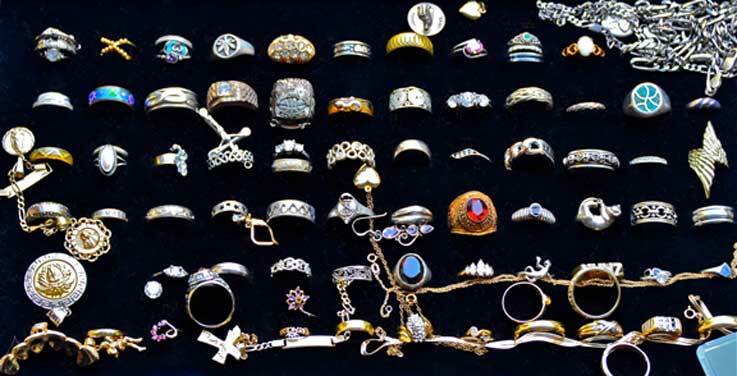 Great Detecting Finds - The best of Big Valley Metal Detectors - 916-225-9150 - gold, silver, jewelry, coins. Prospect like the folks on GOLD RUSH and DIGGERS. This is one of the most gratifying pages to be able to have on mywebsite. It is a showcase of the things that Big Valley and its customers have found. Some of these have great stories behind them, whereas others are merely quiet tributes to the tenacity and the dedication of time and energy the true detectorist possesses. This will always be a work in progress, with pictures frequently posted before text. 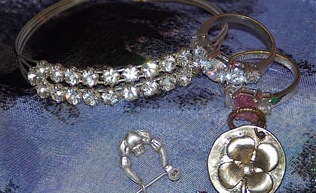 You'll find a very nice ringbox, followed by a testimonial from one of my clients. If I would have sat down to write a fake testimonial, I think I would have liked to make it sound like this, but Henry Bvmd from Davis took care of it for me. You'll find most people's last name on this page to be Bvmd, as all are considered part of my Big Valley Metal Detectors family. 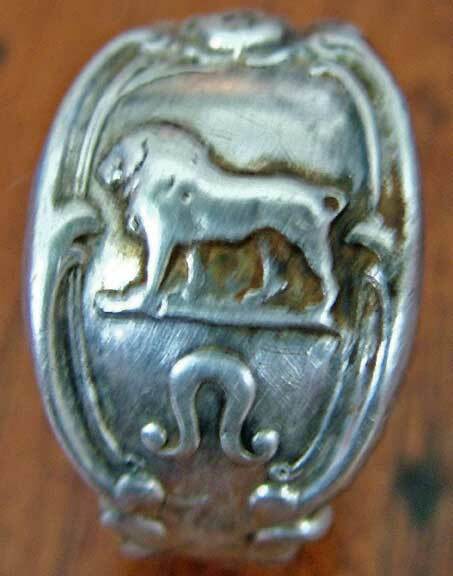 By the way, getting pictures and emails about your great finds are a 'gr8 find' for me. So please keep them coming, or stop by and show 'em off! Minelab's new Equinox 800 metal detector is proving to be a far better than expected treat for those of us who thought we had seen it all and had been pretty consistently let down by "new technology" that occasionally would show up in the market. 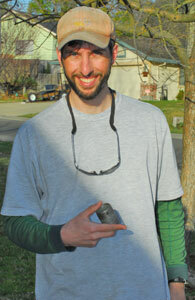 “I love my Minelab Equinox 800 that I bought from Big Valley Metal Detectors. 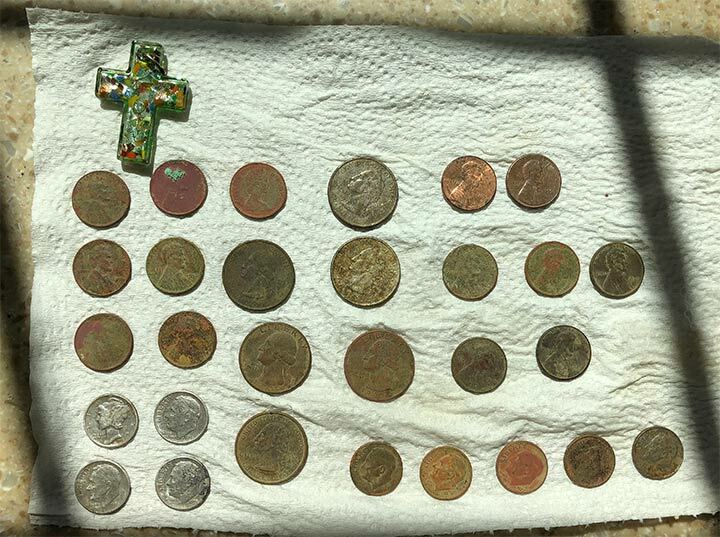 It consistently locates great finds like these in hunted out areas” Jon M.
I can't tell you how common it is to have people assume that only older guys metal detect. While they do make up the majority of my clients, there are ladies in the hobby, too, as well as kids. It is very important not to underestimate kids. 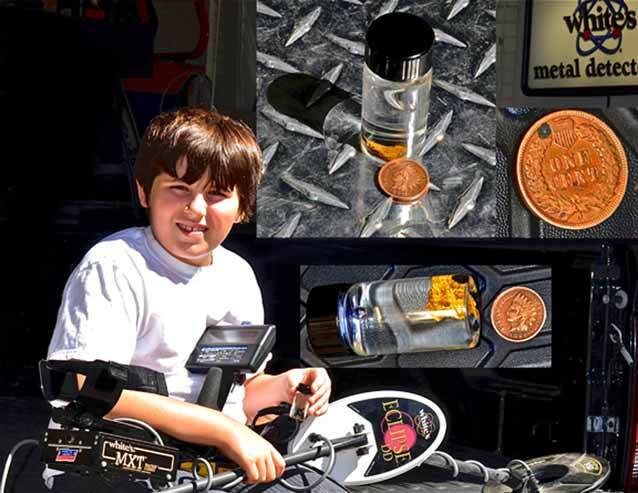 This 9-year-old has found an amazing array of things, including the gold and the 1898 Indian Head penny pictured here. Apex pick does it well. This is a prime example of a "working pick". 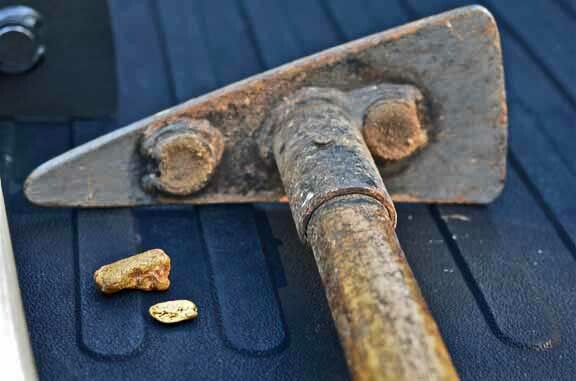 In fact, the day we took this picture, with just a little of the gold it has dug, was the day the owner came in to pick up his next Apex pick. 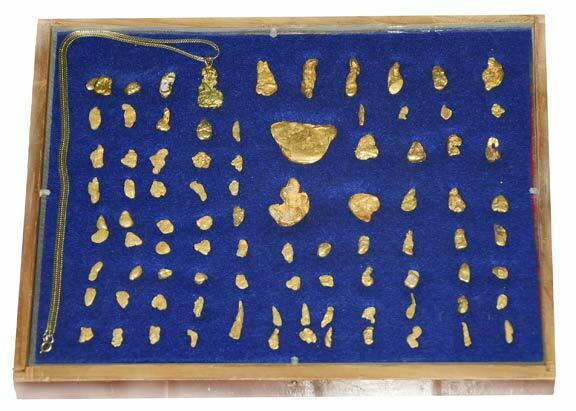 The larger of the pieces of gold is 2.5oz.! Big Valley XP Deus find. 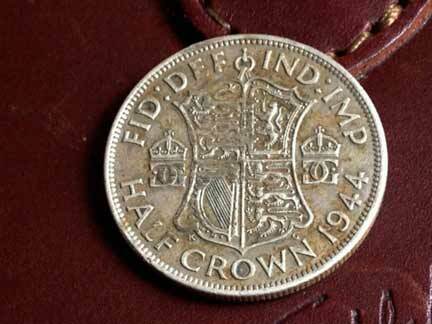 Here is a 1944 British Half Crown I dug today. The yard from which I dug this and other things (coins, tokens etc.) belongs to the neighbor of a friend of mine who owns several of the top machines out there, and he has hunted it for the last few decades. 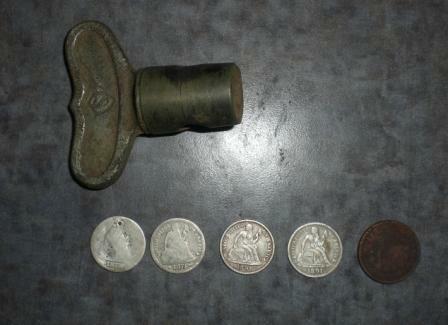 He has been on that nice old property many times with his detectors, and was pleasantly surprised when he saw what I pulled out with the Deus. This yard was a perfect example of a considered-to-be-hunted-out area. I have been to areas like this one many times myself, generally to test new machines that make great claims, but the hunted out places have remained hunted out. XP Deus is delivered better speed and performance than the detectors I had used, so far. Groundtracking on this machine works beautifully. And........... the XP Deus metal detector has non-motion pinpointing capabilities; it can track the ground in both pinpointing mode and detecting mode, which is a GIANT leap! The recovery speed of the Deus is impressive.It approaches Tesoro's speed, as demonstrated on the Board of Pain. This fast recovery time is what makes such a difference when you are dealing with old and trashy areas. One of my customers brought along one of his ringboxes for us to drool over. 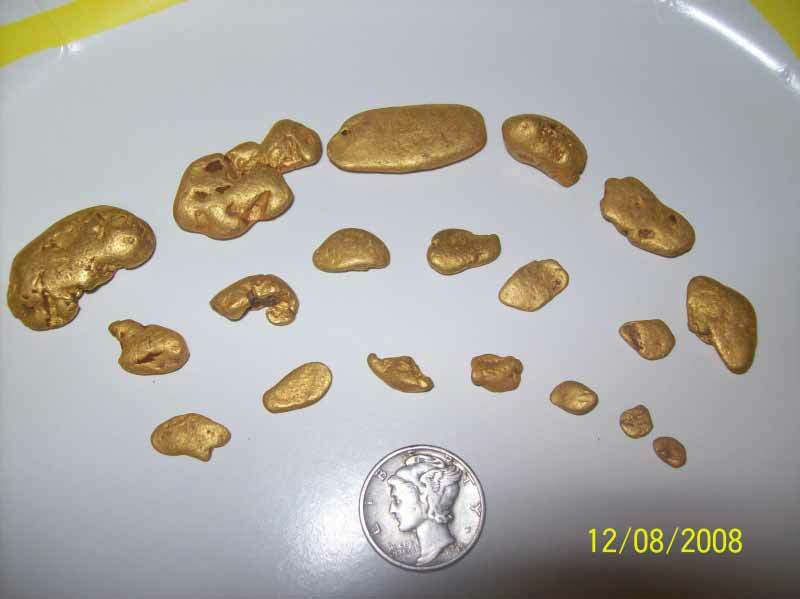 I just wanted to share with you some of the finds that I made recently using the Fisher F2 detector that I purchased from you. I was hunting my buddy’s front yard in the Midtown part of Sacramento. His house was built in 1892. My friend bought it from the original owners family. The property had been altered very little over the years so I knew it would be a good place to look. Unfortunately I did not have a detector two years ago when my friend raised the house and poured a foundation and slab, otherwise I might have found much more. In any case, I hit the jackpot in his front yard a couple of weeks ago. My first good find was a Shield nickel from the 1880’s. It was pretty crusty so we didn’t know what we had found at first. I made the mistake of cleaning it by electrolysis which got rid of a bunch of the junk but also caused enough pitting that we cannot read the last digit of the date. If it is an 1880 (as my buddy wants to think) it would be pretty valuable. If it is an 1882 (as I think) it is not worth much. In either case, it is just a cool find. The next day I started looking again in the same place, only a few feet from the sidewalk. I picked up a nice dime tone through my headphones although I could not consistently locate the target with each sweep. After a few minutes of digging and poking around I located the target with my pinpointer. It was an 1891 seated liberty dime in beautiful condition. Over the next two or three hours I found three more seated liberty dimes: another 1891 in great shape, an 1872 that is very worn with a hole in it as though it was once worn on a chain, and an 1874 in fair condition. 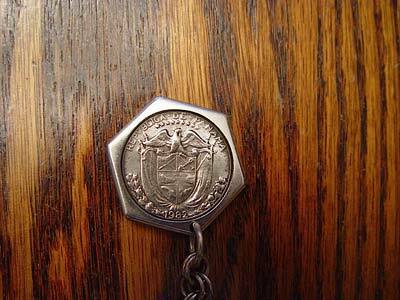 The 1874 has arrows on either side of the date making it a somewhat rare coin. I also dug some sort of heavy button that feels like it is made of lead. It has either a “5” or an “S” raised on the surface. I’m not sure what it is. I found a beautiful old brass faucet about 10” deep in the back yard. That was a satisfying recovery because I was picking up two different tones on the detector (there was a rusted iron washer on the faucet), and I had to dig so deep to locate it. What a great hobby this is. As you said “the targets are limitless”. I am realizing how true that is as I constantly notice new places to check out. Thanks again for your great service. I’ll be back when it is time to upgrade. Ps. You can use the photos and testimonial on your website if you like. 'Carl here with the Vision you just had upgraded to a V3i for me. V3i is working great attached is photo of 4 rings I found with it this last weekend, the gold band is 18K at 16.2 grams, one big honker for sure. I hear that Whites is coming out with a new TDI Pro. ItÂ’s nothing drastic in upgrades but a few new things added and refined from what I understand. IÂ’m considering getting one! My old GM2 needs a buddy to hang with. IÂ’m looking at using it for deep coin hunting and nugget shooting up in the hills. Do you have a TDI you could demo and show me how it works? We could then talk price on the TDI Pro and when you think one would be available. There is a whole lot of good stuff out there in the ground! 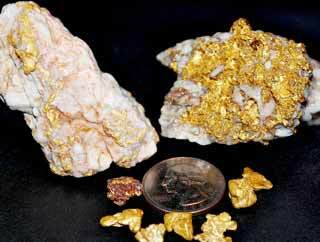 There's gold in them there hills!!! Dave Bvmd pulled these beauties oout of his pocket on a recent visit. With a little dedication, this is what can be found in just 1 season! Got these coins from one of my correspondents. "English Dave" contacted me a few times over the past year. He was a novice in Great Britain, and graciously sent these coins he found along for me to post on my (well, your, really) "Gr8 Finds" page. One of the nicest things about this business is the things I get to see. Some of my customers are very thoughtful, and bring by their treasures for me to enjoy. As you can see, a lifetime of dedication to the hobby can be very rewarding! In February 2008 I was contacted by the Center for Watershed Sciences at UC Davis. They were interested in a machine that could detect medium sized iron objects. I asked them a few questions and found out they were looking for temperature probes. They've been working to restore the Koho salmon population in this area, and it was important to recover the data on the temperature fluctuations from this particular watershed. I made an appointment for them to come by and bring a sample of the intended target. After seeing the object, and finding out that the probes had actually been in a stream for a year, I decided that White's Surf PI Pro would really be best suited for the job. Normally, I only rent out jewelry/coin recovery type 'land' detectors. However, I could see that they had no hope for success using that type of machine. Since I thought that recovering this data is important to us all, I figured I would sacrifice the PI Pro (because I'll now have to sell it as used). So I put the machine together, and gave them a lesson on the machine when they came to pick it up. Whether you rent or buy from me, I'll always give you instruction on the machine. Sometimes, however, that is not enough. And sometimes, you have only 1 chance to get what you're after. Here's where my 9-9, 7 days a week availability came in handy for them, as they ran into some unforeseen conditions. They called me on 2 different occasions right from the stream, and after the second call they retrieved the most important of the probes from the headwaters of the tributary. I thought I would send you some finds that I have made with my Fisher F2 that I purchased from you a few month back. I have had a great time with this machine finding 328 clad coins and a couple that are a little more unique, to me anyways. Starting from the top right to left 1919 wheat penny, 1946 wheat penny, 1952 wheat penny, 1958 wheat penny, 1960 Canada penny. 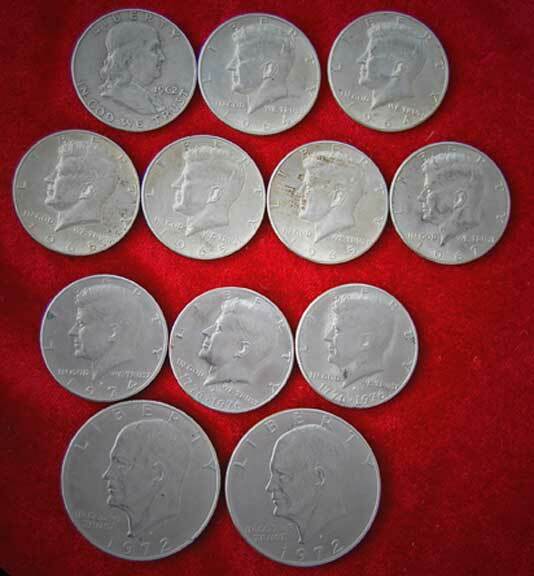 The bottom right to left is a 1945 Merc dime, 1953 Roosevelt dime, 1936 Buffalo nickel. And the bottom is my first ring that I have found so far; it is a 925 silver ring with a stone that I don't know what it is. I love this new hobby and can't wait until I master this detector so that I can grow into a better one. Thanks for the help into this hobby, Larry. 'Nice talking with you the other day! 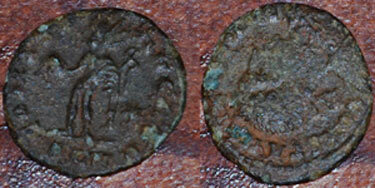 I found these coins on February 6th, 2008 near the low-water line of Folsom Lake. These finds occurred near the end of my 4-hour outing. 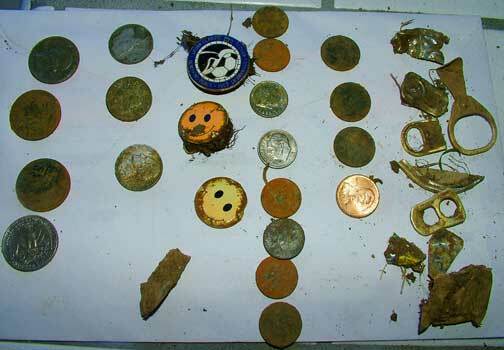 I had picked up a few clad coins earlier, along with many fishing lures and weights, but no keepers! The 1960 penny was dug first, followed by the 1944 "wheatie". At that point, I knew there was a chance for silver in the area. The next signal was a foot away and it was a solid signal that never wavered from the 88-92 range on my DFX. I was hoping for a silver quarter, but was thrilled to find a 1943D Walking Liberty Half Dollar! Boy was I excited. It was my first silver half dollar. 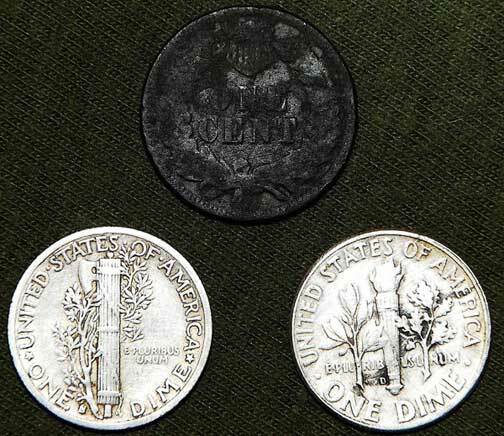 Two more signals turned up 1946 and 1959 nickels. There were no other coins around these 5 coins, so I speculate they were dropped by a swimmer or fisherman sometime in the early 1960s. 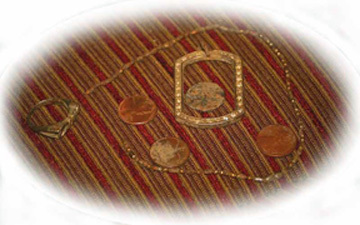 All coins were found in a straight line perpendicular to the waterline over a distance of about 8 feet. The depth was between 6 and 8 inches. I went back two days later for an additional 4 hours. My hopes were high, but the day wound up like most others - a bag full of mostly trash. That's OK though. I've finally found my first "Folsom Silver". Tom is one of those customers who take full advantage of my services to become successful. 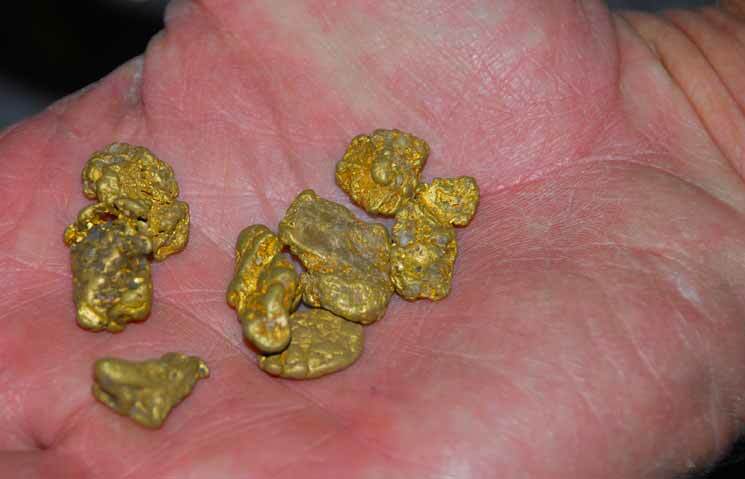 After he had used his detector for a while without finding any serious gold, which is what he was targeting, he called me. I gave him some advice on a few changes, and he sent me this note, along with the picture, within a few days of that conversation. Hope you are enjoying your time off. I went out on Mon the 24th and guess what I found? You are right, I found my first diamond ring. It registered 16-18. I thought I would give it a shot. It was about 1 1/2 " in Senior Court at my old high school right behind a little bench. The band is 14k. Not sure about the diamonds. 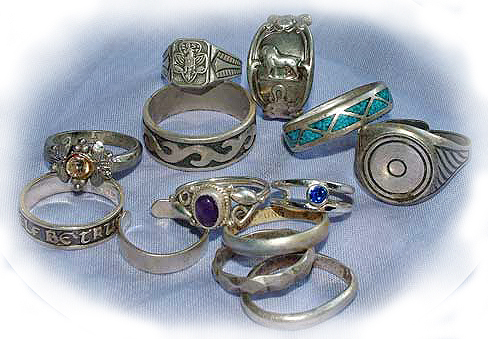 I am going to check with the school to see if anyone lost a ring. 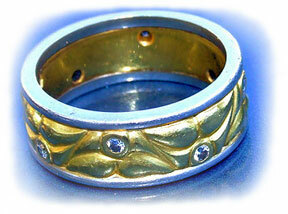 Here is a picture of the ring. Talk to you soon. By the way, I got the coil on Sat. Thanks a bunch. In October of 2007 I had gotten permission to hunt an old house I had had my eye on for a while. 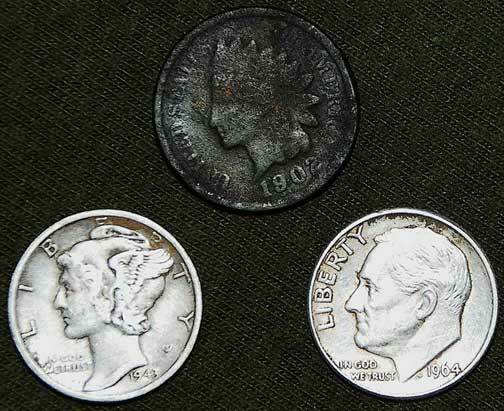 I selected my Minelab Explorer SE to take down there, and, as you can see from these silver dimes and Indianhead penny I found, it did not disappoint! I took out one of my customers who had purchased a White's M6 from me for field training. We had an excellent session, and this is what he came away with from that trip. This ring is one of my earlier finds. I dug it at about 8" with the Explorer II. I tried to find out something about it, and finally ended up posting it to a forum. There I was told that the marks on the back of the ring were very old ones from Britain! 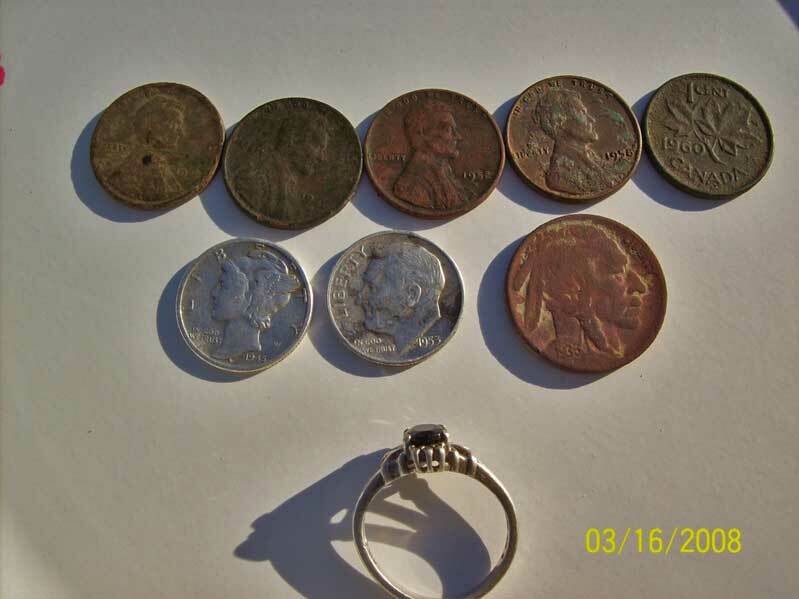 This Australian penny from 1927 I found along with this white gold ring when I was out water detecting with the Excalibur from Minelab. I was surprised to find such an old coin in the water so far away from where it came from, and it was one of the more exciting finds I made that week. 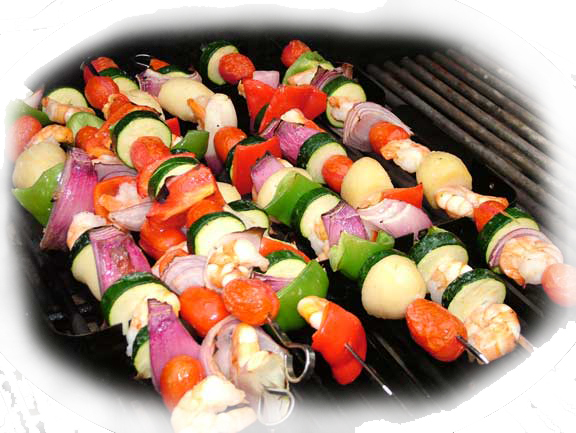 Larry's kebobs are famous around the world!!!! 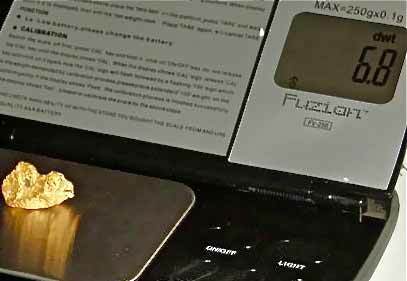 Big Valley customer hits gold! I spend a lot of time field training my clients, so that their metal detectors do not end up in the closet. But sometimes, the hunt is for something much more specific than the average unique or valuable treasure. Such was the case with Kris K. of Sacramento, who had lost his wedding ring in Lake Tahoe, and was not willing to abandon it. He called me about renting a machine from me, but needed a water machine, which I do not rent out. He then got a dive outfit from Lake Tahoe to look in the general area where the ring was lost, without any results. 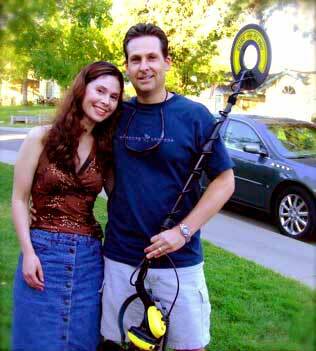 Finally, 2 days later, he decided to come and buy a metal detector from me. After listening to him about the likely location of the ring, and being very familiar with the specific ground conditions in that area, I came to the conclusion that the pulse induction Surf Pi Pro would be the right machine for the job. 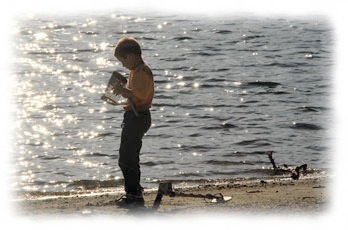 Since he had lost the ring in approximately 3' to 4' of water, it was important to get him set up with a detector that could be fully submersed, if necessary. Once we decided on the Surf Pi Pro for him, I spent the lesson, which I include in the purchase of a new detector, showing him how to properly identify targets. Well, Kris and his wife Jennifer went back up to the Lake, and determined the general area to be covered. I had discussed proper searching procedures with Kris, and, to make sure he would have everything he needed to be successful, I also lent him my Sierra Super Scoop to aid in his hunt, telling him thow to use it to avoid wasting time. Their original plan had involved selling the detector if or when the ring was recovered, but after the thrill of the find, the decision was made to hang onto their Surf Pi Pro. 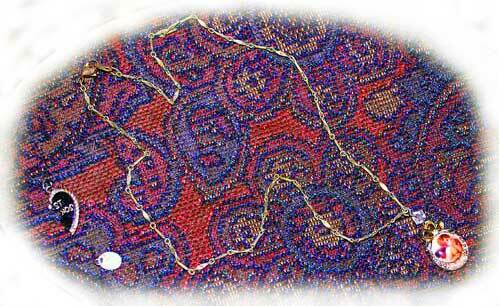 The temporary loss of the ring had made them realize how sad it is to lose something that important. 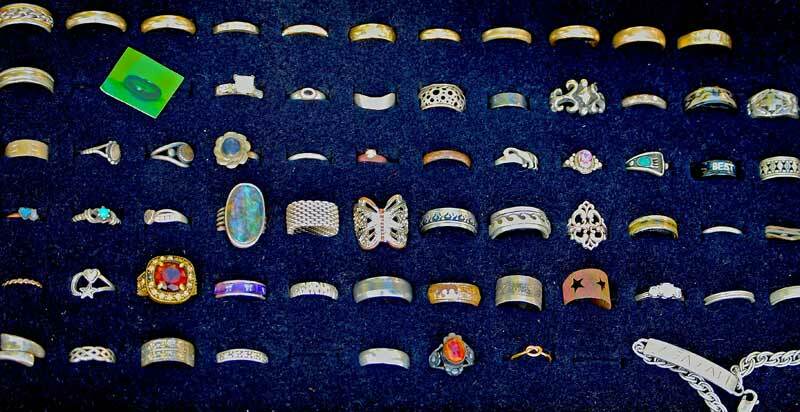 Now they are hoping to recover more lost valuables, and try to return them to their owners! Recently I was out hunting with the Fisher F75, and uncovered this nice cache of mostly silver coins wrapped in cloth and a plastic bag. During the first hour out with his White's DFX my customer, whose name I did not get permission to mention, found all these objects. Got these pics and note recently from one of my customers. 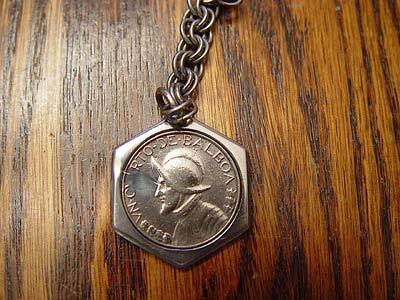 'This is a coin from Panama which was made into a key chain. I found it yesterday at a local park. The coin showed up on the DFX as a dime, which I thought was strange due to its size. When I got home I looked it up on the internet and found that it is 1/10th of a Balboa which means it is a dime, I guess. Looks like the DFX knew it was a dime! Another fellow told me that he found one and it showed up on his DFX as a quarter. On the internet I read that this coin has been minted by several mints all around the globe and that the metal content will change depending on where it was minted. I guess that is why it showed up as two different coins. Anyway, it was a neat find. I can't tell you how many pictures I have like this one to attest to a few hours spent detecting. 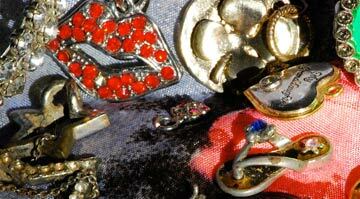 And although it may not seem particularly valuable, finding a lot of objects is both satisfying and instructive. The finds you do make can indicate that, depending on what you are hunting for, you need to adjust your machine's settings. Or, on the other hand, it can show that you are exactly on the right track, but just have not run into what you are after. 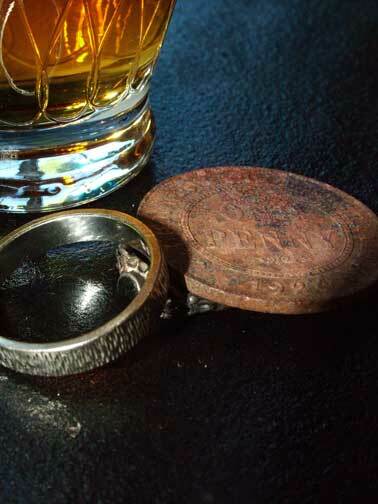 These variables make having an expert, who is readily available for any questions that may arise, an invaluable part of your detecting experience. from the little boy you see throughout my website. 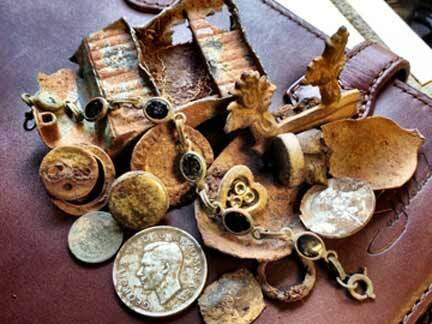 My little guy has been detecting since he was 5 years old, and here are just a few of his "gr8 finds". ...but a lot of it could be! Text supplied by third parties may be edited for typos or to "fit the size of your screen" (or your attention span...).